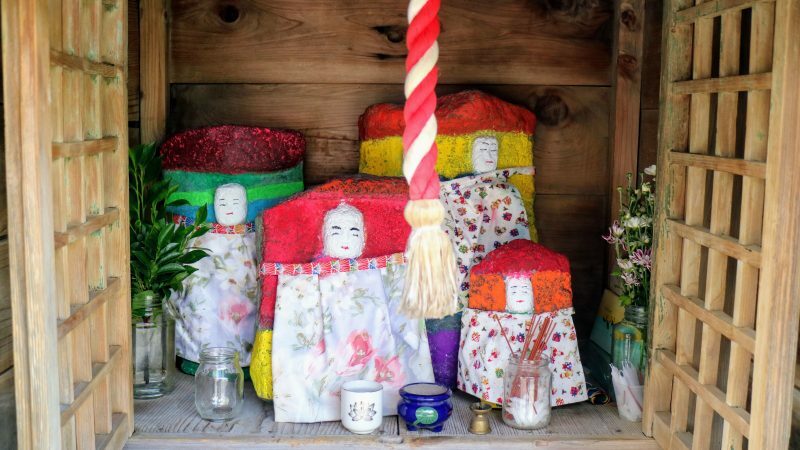 Hand-painted Jizo statues in Obama, Fukui Prefecture. Photo by Nevin Thompson. If you’re interested in learning more about some of the more offbeat folk traditions of Japan, the Twitter account Unusual Festivals of Japan Club, (or ‘KFC’ for short; the ‘K’ in the acronym stands for 奇祭, kisai, or ‘unusual’) is a must-read. Tweeting multiple times a day, KFC documents the myriad local traditions of Japan, some of which date back more than a thousand years. In this festival occurring on the remote Noto Peninsula, inebriated men haul around gigantic portable shrines to mark the end of the harvest. Each year on September 20, Kumakabuto Arakashihiko Shrine in Nanao, Ishikawa holds the ‘Okuma Kabuto’ festival. Portable shrines weighing 1 tonne with 20-meter flagpoles called ‘wakuhato’ bear Sarutahiko Okami (one of the ‘six great kami’ of Shinto). The highlight of the day is watching the shrine-bears dash up the hill to deliver the god to the main Shrine hall. Yamagata ‘Beastly Festival’ (Bakemono no Matsuri, May 25 each year): Sugawara no Michizane festival, Tenman Shrine in Tsuruoka, Yamagata Prefecture. Following Sugawara no Michizane’s banishment (following court intrigue about 1,000 years ago), it’s said his followers, fearing being associated with him, disguised their faces when drinking together. In this festival, participants silently drink sake or juice as they dance. Portable shrines, called mikoshi, play an important role in Japanese festivals. This festival in Uji, in Kyoto prefecture, features a mikoshi that transports Brahma-Deva, an important protective deity in Japanese Buddhism. Kyoto Agata matsuri: Each year from June 5 to the end of the month (also known as the kurayami kisai, or ‘the dark rite’). Festival attendants transport a ‘Brahma-Deva’ (bonten, 梵天), bamboo pole with paper sphere that serves as a portable shrine. The attendants shake the pole from left to right as they walk all throughout the night. Yamaguchi Inari festival: Each year on November 3, a “fox’s wedding” (kitsune no yomeiri) is held for the fox (god) enshrined at Hanafukutoku Inari shrine, in hopes of a bumper crop and prosperity. Roles for the bride and groom are chosen from local residents, and those who play the bride are said to be a suitable candidate for marriage because of the auspiciousness of the event. However, the identity of the bride and the groom remains secret. Some of the festivals KFC highlights are quite old. This festival in southern Nara prefecture dates back over one thousand years and has ties to the mountain worship of the region. Nara Jumping frog (kaeru tobi) festival, July 7: One of several annual events to commemorate the annual rengekai rite at Kimpusen temple in Nara. A man slandered a local deity and as a result, a great eagle hung him from a mountain crag. Finding the man and taking pity on him, a Kinpusen temple priest turned him into a frog so he could get down off of the crag, and then back into a human again. This video provides a more detailed look at this festival devoted to jumping frogs. The KFC Twitter account also highlights common folk traditions in rural Japan, such as “bull sumo” or bull wrestling. Uwajima, Ehime bull sumo (ushi-zumo): Occurring several times a year, bulls face off in a sumo ring in a one-to-one competition. Bulls are ranked, and there is no time limit for matches. Bulls that lose spirit and attempt to run away are named the loser. In consolation, bulls who lose claim the prize money. Another interesting folk tradition described by the KFC account is the old Okinawan practice of hajichi, or traditional tattoos. Okinawa ‘Hachiji’: As part of a tradition maintained by women in Okinawa, in southwest Japan between the ages of 12 and thirteen, hands are tattooed to confirm passage into adulthood, as well (in later years) as proof of marriage. The tattoos were considered fashionable and chic, and the occasion of the first tattoo was commemorated with a family celebration. The practice has vanished since the end of the Second World War, but Lex McClellan, writing on Medium, provides some interesting background on hachiji. Another regional custom profiled by the KFC account is the practice of Yomeburi, which happens along the Japan Sea coast wherever buri, a fish commonly consumed in the winter months in Japan, is caught. The image in the tweet comes from the manga and anime series My Bride is a Mermaid (瀬戸の花嫁). Toyama Yomeburi Festival: In this festival, when a daughter leaves home to become a wife, as a year-end gift the bride’s family sends a buri (a kind of jack fish) to the groom’s family, in hopes of success in life. The buri should be as large and grand as possible. At the fishing port in Himi, Toyama, it’s said the buri are so fatty that the fat repels soy sauce. The KFC Twitter account posts about Japanese folk practices several times a day. While the tweets are almost always in Japanese, the images alone provide an intriguing glimpse into Japanese life. Image from article: IDF Chief of Staff Lt. Gen. Gadi Eizenkot (front left) visits Israel’s border with Syria in the Golan Heights, Nov. 20, 2018. Photo: IDF Twitter account. JNS.org – Donald Trump’s decision to withdraw ‎American troops from Syria shocked many in the ‎United States and the Middle East. Given the recent discovery of Hezbollah’s grid of ‎terror tunnels and Iran’s attempts to upgrade its ‎offensive capabilities, it is reasonable to assume ‎that Israel is closer than it has ever been in the ‎last decade to a war in the northern sector. This could prove highly complex from a ‎military standpoint and eve..
reutersinstitute.politics.ox.ac.uk; original entry contains links on the speakers. image (not from entry) from9.45-11.00 – Session 1Old dog, new tricks: from leaflets to mass mediaHave governments evolved newer forms of propaganda in the 2010s? The panel discusses the period of transformation and cultures contributing to the rise in modern propaganda. Tomasz Augustyniak, Journalist and Asian correspo.. Talent [“Former Senator Jim Talent..